Posted by Our usual sushi joint was closed as Sushi Wasabi closes one ever year for a few weeks so they can enjoy a family vacation (work life family balance yaah! 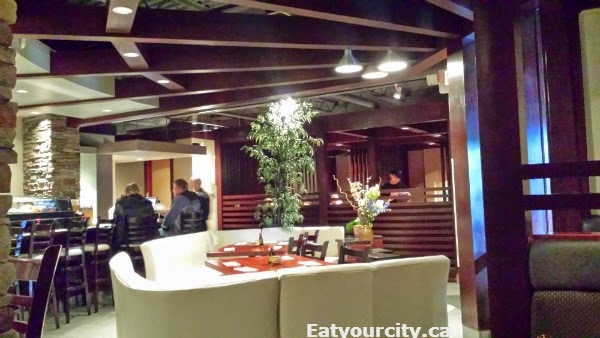 ), so we gave Yokozuna a try as we were craving some Japanese fare. Since we just decided to drop by after work, we weren't able to try the chef's okamake - its a chef's special meal where he takes note of what things you like or don't like, budget per person and they need at least 2 days notice to shop for off the menu ingredients and you eat whatever he makes. One of my girlfriends enjoyed a a few lobster themed omakases a while back with a big group of friends... but we tried plenty of items off their regular menu instead.. onto the food! The dining area has plenty of little nooks and crannies for seating with the sushi bar in the back, giving both a sense of privacy and openness at the same time. Its dim, though each table has a thoughtful bright light above so you can actually see your food, while the central white loungy sofa, dark panels of warm wood and stone gives it an upscale feel. Service initially was attentive and dwindled after we ordered about $100 of food between two people.. perhaps it was because we didn't order alcohol? Ah well, its Alberta and I never set my expectations high on service for any new restaurant we try. We're seated quickly, though we took a bit of time wading through the extensive menu. There's a wine menu, a mid sized sake menu (we've sampled most of them elsewhere on our travels and only like trying new ones we haven't seen before) and green tea, which was brewed in a small french press... they put part of the tea leaves on top of the filter (which kind of defeated the purpose of filter), but I quickly remedied that by taking it apart and chopsticking all the tea leave bits back into the bottom (no pic). We started with Roy's Butakaku Tacos. Tender pulled pork (advertised as pork belly), was piled on top of two soft tacos and the topped again with some pickled cabbage slaw and some diced tomato. The tender pulled pork was braised in a nice rich sweetened sauce that played well with the crunch of the slaw, a bit of tartness from the tomatos for a well balanced bite. 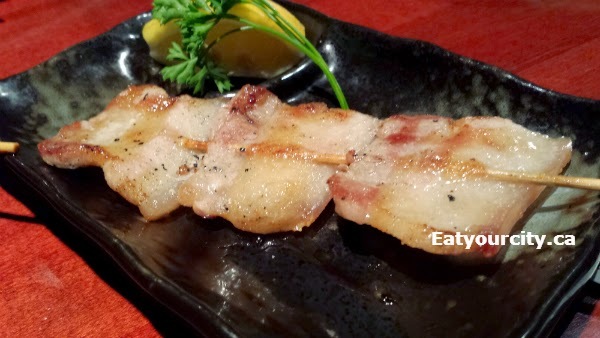 For grilled skewers, there's a minimum order of three, and since it was just the two of us, we had one of the Tontoro pork belly, one of the Ebi kushi shrimp with soysauce and butter, and one of the Hotate Kushi scallop with soysauce and butter. This appetizer strangely didn't come out till the end of the meal, but that was ok. The Tontoro skewer unfortunately fell flat. We had the choice of sea salt or teriyaki sauce, and we went with sea salt as we thought we'd be able to better appreciate the piece of pork belly. It was heavily salted on one end and bland on the other, and the meat/fat itself was very chewy and tough... maybe an off night? Next time I'll stick to the tasty pork belly tacos instead. 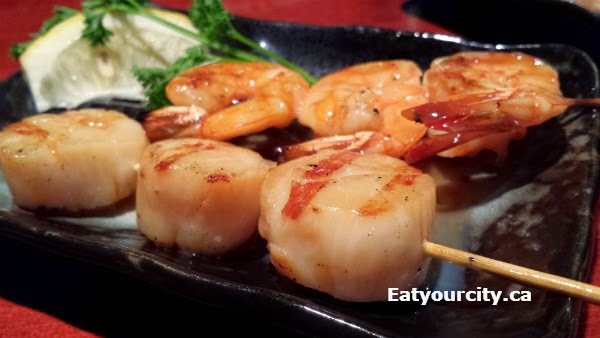 The Ebi kushi and Hotate kushi were both simply and expertly grilled shrimp and scallops, sitting in a pool of lemon butter (not the soy sauce butter as the menu stated). Both were a touch on the over salted side - I enjoyed them, while my boyfriend found them both overpoweringly salty... more for meeeee! The soft shelled crab was twice fried... a bit too long so while the breading was nice and crispy warm, the crab was a bit dry on the inside. Still a large and tasty roll though! The Black Dragon Roll Scallop, tobiko, avocado, tempura crumbs, mayo topped with unagi and teriyaki was one of the winners of the night. 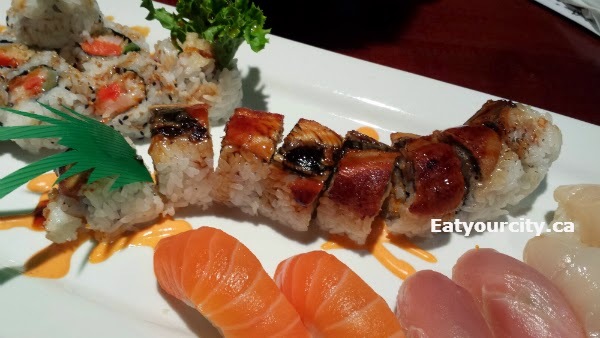 There was a good amount of scallops inside the roll, with creamy avocado, crunchy tempura bits and a tender melt in your mouth grilled teritaky unagi on top. Yum! The Seafood Tartar Roll -Scallop, tuna, salmon, tempura crumbs, tobiko, mayo, topped with teriyaki and sesame was also tasty. There was a bit too much going on as the teriyaki sauce masked alot of the other flavors rather than letting the simple flavors of the fresh scallop, tuna and salmon shine through. We were craving sushi, so we went with individual orders of sushi nigiri - each order comes with two pieces. We had the sake salmon, maguro tuna, and hotate scallop sushi nigiri. While the salmon, tuna and scallop were nice and fresh, the sushi rice needed a bit more sushi vinegar and a touch more cooking water - it worked well in rolls, but the rice was underseasoned and fell apart when it was used on the sushi nigiri. We packed home a bunch of leftover rolls as we had over-ordered quite a bit for a table of two, but we wanted to try a selection of their menu. We'll likely come back and try out more of their uniquely named fusion sushi rolls and appetizers as that's where their strength seems to lie, or try to remember to book earlier to try out their off menu omakase.